This is part one of a two part interview. 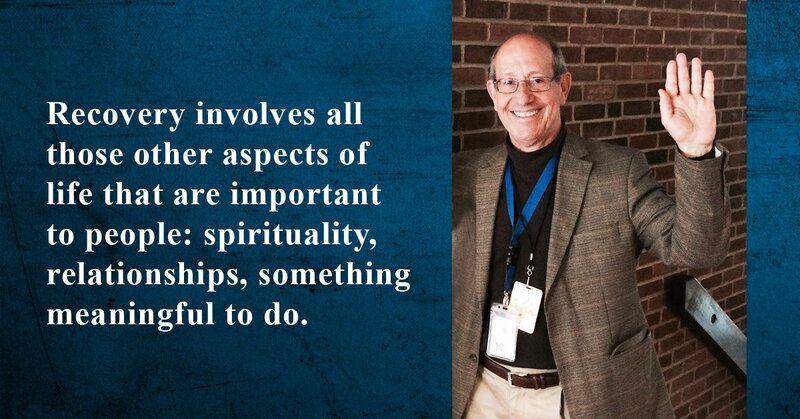 Follow this link to read part two of Bud Clayman’s interview with Dr. Larry Real. 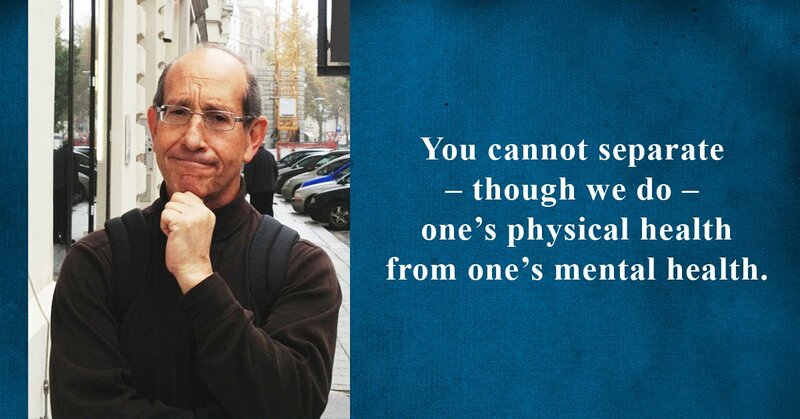 I first met Dr. Larry Real in 1992, when I was mentally sick and in a lot of emotional trouble. I had already begun to show symptoms of bipolar disorder, and was not sleeping well, no matter when I tried. My mom, Lila, had been part of a family group that was sponsored by AJMI (Alliance for the Jewish Mentally Ill) which later became the Jewish support group, Tikvah. When she saw that I was beginning to lose it, she contacted Larry, who was a co-founder of the group, and he suggested that the three of us meet. I was very reluctant because I wanted to be left alone, and God only knew what he had planned for me! When we first met, I was zoned out and very fearful. But Larry laid it all out on the line for me: I needed some type of assisted living facility for people with mental illness. I needed to learn how to become independent again and manage my illness, because I did have an illness, whether I wanted to admit it or not. At the end of the meeting Larry said something like, “And you’ll need to learn how to flip a burger again for yourself.” I was always ordering take-out and eating unhealthy foods during my illness. I have reminded him about that statement over the years and we both always have a good laugh, but it was true. And although I have been out of assisted living and on my own for fifteen years now, I still owe a lot to Larry and my mom for getting me on the road to recovery. I am proud to say that I can now call Larry a friend and colleague and not just another doctor who has passed though my life. 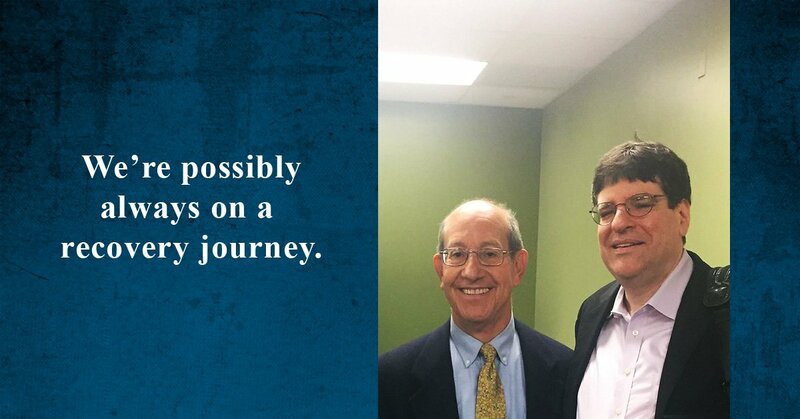 When I met Larry in 1992, he was an integral part of the administrative, clinical and teaching staff of the Department of Psychiatry at Albert Einstein Healthcare Network. He served as Medical Director of the Belmont Center for Comprehensive Treatment in Philadelphia from 1997 to 2010. That year, he joined Horizon House, a community resource for individuals with mental illness and/or substance abuse disorders in Philadelphia, and became its Medical Director for five years. Currently, Larry is the Chief Medical Officer of Department of Behavioral Health and Intellectual disAbility Services for the City of Philadelphia. He ensures the alignment, coordination and integration of clinical initiatives and system transformation efforts across DBHIDS and throughout the provider community. He has also been acknowledged for his long-standing support of the family advocacy movement, including being amongst the first recipients of the Exemplary Psychiatrist Award from both the National Alliance on Mental Illness (NAMI, 1992) and NAMI Pennsylvania (1993, 2013). He is a co-founder of TIKVAH/AJMI. This interview took place in Larry’s office at the Department of Behavioral Health. Dr. Larry Real: I think the treatment systems in the United States and the world are good and getting better. They’re not anywhere near where they need to be. I think one of the most encouraging aspects of what we have to offer people in recovery is evidence based treatments. Meaning treatments that have been shown to work and benefit people along their recoveries. The downside of that is the challenge of getting these evidence based practices into more general use. What we tend to have instead are isolated pockets of excellence, where clinicians are using the evidence based practices, but other providers are brought along more slowly. So it’s the broader implementation of these treatments that we already know are helpful to people that is one of the major challenges these days. Bud Clayman: Are we getting better [or] are we getting worse? Do we need to move quicker? Dr. Larry Real: Oh, I’m an impatient person. I always feel we need to move quicker. For example, we’ve been fighting stigma and discrimination in multiple ways, such as in health insurance, including federal insurance programs like Medicare, for many years. Until just recently, if a person with Medicare saw a psychiatrist, she’d have a 50% co-pay, versus a 20% copay if she went to seea dermatologist. When Congress finally decided that that was unfair and parity legislation was passed, the regulations were changed such that the co-pay for psychiatric visits would be 20%– phased in over four years. To me, if it’s a good idea, you do it tomorrow. Bud Clayman: You do it tomorrow ‘cause you need it tomorrow. Dr. Larry Real: An additional dilemma I think we all face is an ironic one, especially when working with people with serious mental illnesses. The President’s New Freedom Commission report, back earlier in the century  basically said it’s time to transform to a recovery orientation. Since that time, one of the major barriers to transforming services are the numerous federal regulations that get in the way of implementing recovery oriented approaches, approaches that are person centered, not illness centered. Payment for services has not transformed quicly enough. That’s a little bit frustrating, though we continue to make slow but steady progress in that regard. And I think it may partly explain why certain innovations haven’t hit the United States as early as they have hit other countries. For example, in particular the concept of early identification and intervention for people with psychotic disorders. Dr. Larry Real: There are people who are at clinical risk because of mental health challenges they develop in adolescence, or they may be at genetic risk, because their older sibling developed schizophrenia at a young age. If you can identify people who are at risk or who have just had a first psychotic episode, there’s a fair amount of literature indicating that early intervention may affect the long term course of the illness. You can help preserve people’s work and social functioning. They’ve been doing this in Australia, in Denmark and other places for years, and we’re just getting around to doing this in the United States. Basically we’re talking about the time lag between when a person shows signs of illness and when he gets into treatment. It is disturbingly long in the United States. And that means people are suffering unnecessarily. Bud Clayman: Why is that so? Dr. Larry Real: Well I think it’s a combination of stigma and a lack of education. It’s people not knowing what to do when there is an early warning sign. And it’s our systems not being adaptive enough to get to people early enough. If you don’t have early identification and intervention programs, then there’s nowhere to refer people. Bud Clayman: What specifically are the solutions to this? 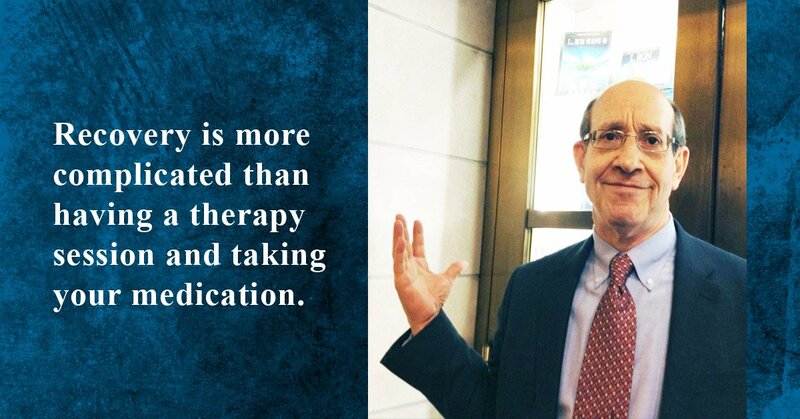 Dr. Larry Real: Well, you know, I think as we are evidencing in Philadelphia, transforming agencies within systems of care to recovery orientation is where it is headed, particularly in the treatment of serious mental illnesses, but also in the treatment of all health problems. If you look at the Accountable Care Act, if you look at the movement to generate person centered health homes or person centered medical homes, it’s basically emphasizing recovery principles. 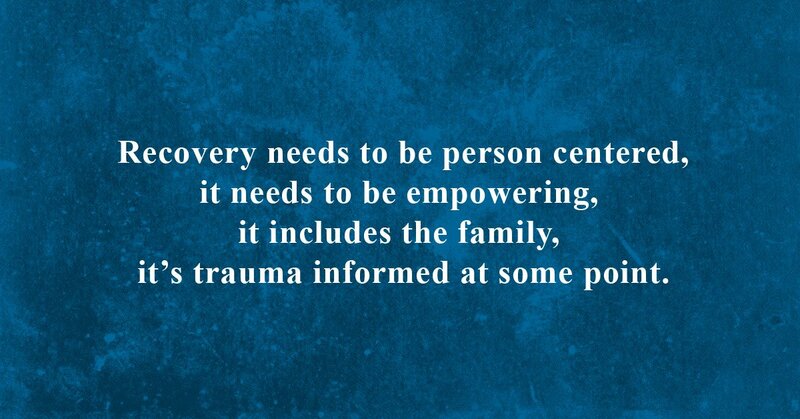 It needs to be person centered, it needs to be empowering, it includes the family, it’s trauma informed. I think that’s certainly what we’re trying to do in Philadelphia and throughout the country. You know, you have to transform all of the services that are available. There was a five- year push sponsored by SAMHSA, the Substance Abuse and Mental Health Services Administration, for all of the major disciplines to provide training that brings recovery principles more broadly into practice, it’s called the Recovery to Practice Initiative. Psychiatry has one, as do the psychologists and psychiatric nurses, and now there’s even some cross fertilization between those groups. It’s not enough to just declare you’re going to transform a system of care to a recovery orientation. The people who staff the system need to practice consistent with that orientation. And of course, with that orientation, people have a much broader perspective. They realize that helping people with their recovery is multi-dimensional. The path to recovery is more complicated than having a therapy session and taking your medication. It involves all those other aspects of life that are important to people: spirituality, relationships, a sense of purpose in your life. I think as we transform the systems and transform the people who work in the systems, those are the two things that will continue the momentum that we’ve generated to date. Bud Clayman: Is the mental health infrastructure there or is it evolving? Dr. Larry Real: It’s evolving and what I’ve noticed in my own experience, and I’m a facilitator for Recovery to Practice training in psychiatry, which we have struggled to get off the ground, but increasingly those of us who care about this realize that where it really needs to begin for psychiatry and other disciplines is medical school or residency at the very least. We need to teach people these kinds of principles and not try and add them on at a later point in time. I would add one other thing that I think is a fairly consistent message that you hear. There’s lots of talk about integrated care, collaborative care these days. And certainly those of us in public service psychiatry believe very strongly that the head and the body are connected by the neck. And that what we’re really talking about is people’s health. And a holistic approach, and you cannot separate — though we do — one’s physical health and well being, from one’s mental health and well being. Of course some of this interest has been spurred by the information we’ve had for the last ten years about premature morbidity and mortality in people with serious mental illnesses. Bud Clayman: What is your concept of the word recovery? Dr. Larry Real: I think it’s important first to see it as a potential outcome, primarily to counter what used to be called the clinician’s illusion. When you’re in training, you typically work with the most seriously ill people. When I was in training, the basic notion was that schizophrenia, in particular, was an illness from which people never got better, and one that quite often had a deteriorating course throughout the person’s life. So, we all practiced in a way consistent with the belief that people didn’t get better, and the best you could do was keep them from getting worse. That stability was the target in those days. And it’s important to note that some of the long term outcome studies, such as Courtney Harding’s, who studied people who had left the state hospital back in the ’60s or the ‘70s, some of whom stayed in the treatment system for the next 10, 15, 20 years, some of whom did not. And compared the outcomes. Basically, those people who had left the treatment system, even with diagnoses of psychotic disorders, were doing as well or better from a functional standpoint than the people who had stayed within the treatment system. Many had recovered and were living essentially normal lives. So, as an underpinning, some people do recover as an outcome and we need to remember that, because you don’t necessarily know who they are at the time when their illness is acute. Otherwise, I agree with those who see recovery as a process. Bud Clayman: Do you ever stop recovering? Is that an end goal, an end game? Dr. Larry Real: Probably you don’t. There may be points where you’re not actively in a recovery process because you’re quite happy with the way life is. You’ve achieved the goals that you want to achieve. Retirement is like the ultimate recovery from working. But I think for many people, the process continues. Just like people who are educators, you know, in my field where you’re supposed to keep up with the field, lifelong learning is the new phrase for continuing medical education these days. So we’re always on an educational journey. We’re possibly always on a recovery journey. In the second installment of this interview, Dr. Real discusses the steps needed to recover from a mental illness. There are people who will help you. There are paths to get to those goals that might have seemed unattainable for the last while.